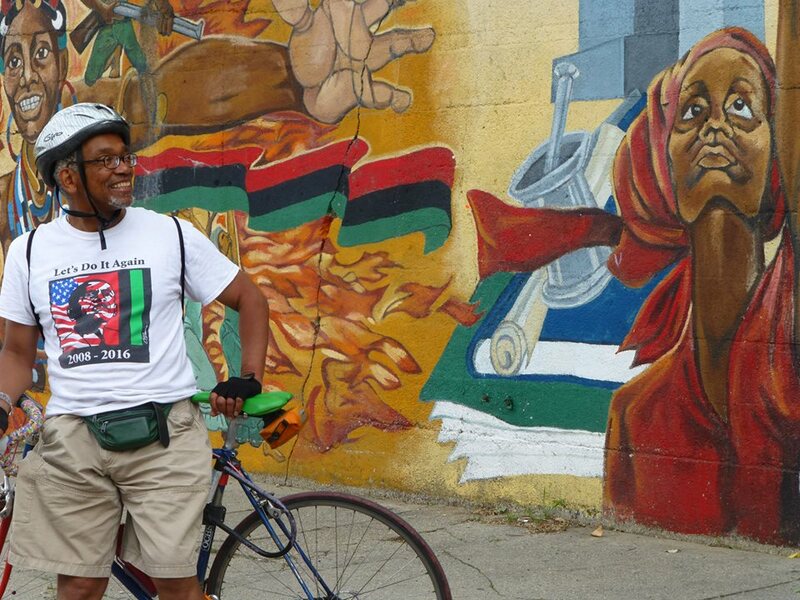 Checkerboard City: Is Bronzeville Chicago’s Next Bike Mecca? In spring of 2013, Loyd and a few other South Side bike enthusiasts launched the group, using the Bronzeville Community Garden, just east of the 51st Street station, as a hub. On the second Sunday of each month they hosted a pop-up bike shop, with mechanics and youth apprentices from Woodlawn’s nonprofit Blackstone Bicycle Works offering basic repairs like flat fixes and brake adjustments free of charge. On the first, third, and fourth Sundays of the month, the group put on free bike rides showcasing the neighborhood’s art, sustainability efforts, architecture and history. Art collector Patric McCoy led tours showcasing murals and visiting the homes and studios of a dozen artists. Green thumb Latrice Williams took riders to local gardens and urban farms to sample the produce. Architect Sharon Samuels led an excursion to some of Bronzeville’s architectural gems, such as the Pilgrim Baptist Church, known as the birthplace of gospel music. And author Nate Thompson gave a tour highlighting the colorful history of the neighborhood’s “policy wheel” numbers racket. Each tour drew between ten and forty participants. The group also had a big contingent in the Bud Billiken Parade, billed as the nation’s largest African-American parade, and provided ride marshals for the University of Chicago’s annual South Side ride, which drew nearly 100 people. Bronzeville Bikes often collaborated with other organizations and efforts promoting biking among African Americans, such as the group Red Bike and Green, and the city’s Go Bronzeville transportation demand program and GreenCorps youth bike and horticulture program. 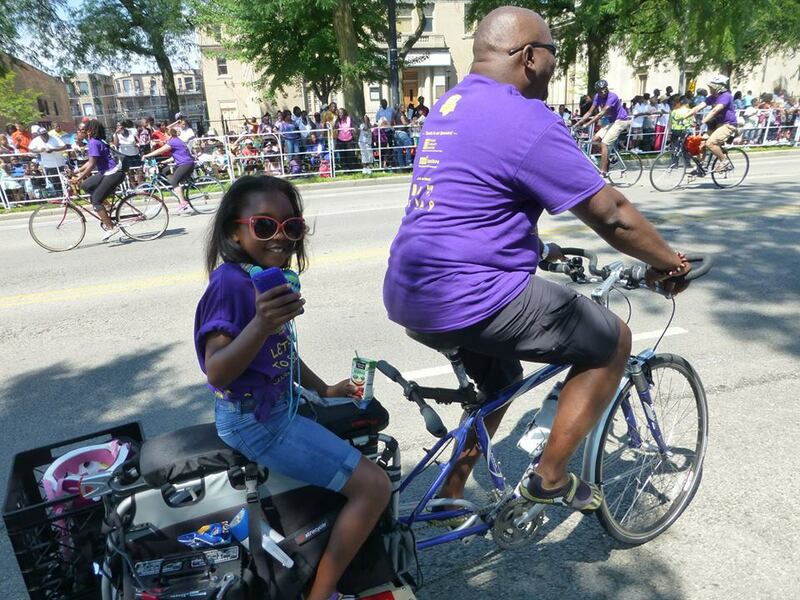 This year, Bronzeville Bikes is planning more community rides, and is looking into offering pop-up bike shops at more locations. Health problems like heart disease and diabetes are prevalent in the neighborhood, and many church leaders have become interested in cycling as a fun way to promote physical activity to their parishioners, so they may be open to hosting repair sessions after Sunday services. Bronzeville Bikes also plans to run an earn-a-bike program, where ten youths will learn bike safety, mechanics and advocacy. After completion of the program, they’ll be expected to serve as ambassadors for cycling in the community. To further address the neighborhood’s “bike shop desert” issue, the group will be rolling out the Bronzeville Bike Box in June. This semi-permanent bike shop will be located in the parking lot Loyd is building on a vacant lot next to Bronzeville Cookin’. “Although the Green Line is right there, many people won’t be comfortable taking the train here, so we’ll need a parking lot within eyesight of the restaurants,” he says. The permeable-surface lot may also house car-sharing vehicles and fueling stations for electric cars. Bill Depenbrock, a carpenter who also volunteers with GreenCorps and Working Bikes Cooperative, is spearheading the bike box project. The shop will be housed in a repurposed shipping container—due to our trade imbalance with China, many of these accumulate in yards along the south side of the Stevenson between Kedzie and Pulaski, he says. Depenbrock says that while volunteering and biking on the South Side, he’s been inspired by the many people he’s met who are working hard to improve their neighborhoods. “I’m impressed by Bernard’s projects because they represent this great synthesis of job creation and an ecological vision,” he says.